Seat is completely removable from board and detaches through a clip in and out system. Total weight of seat and base is just a little over a pound (super light). Built for use with your stand-up paddleboard, SupSeat is suitable for all kinds of paddleboarders, from beginners to pros, and even disabled individuals who want to try out the sport. The base of the SupSeat measures only about 7"x8" and it stands just about an inch and a half high off the board. The device features a storage basket for food and gear, along with a water bottle holder, which makes it easier to stow supplies without having to bring a wet bag. Instead of wearing your life jacket all the way through your paddling course, you can simply hang it on the seat so you can move more freely while paddling. 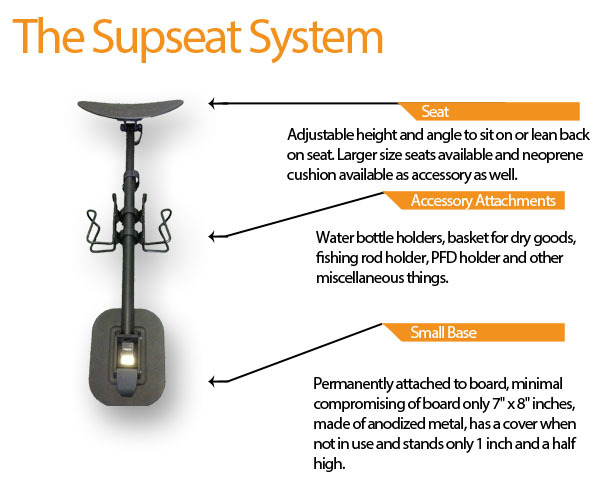 Installing the SupSeat base permanently is minimally invasive, thanks to its small size. Even with the permanent base, you can still choose to remove the seat as needed and put on the base cover so the paddleboard remains usable. The SupSeat conveniently pops up and falls back on the board with a simple push of a button. In addition to the storage panel and bottle holders, this specialized paddle board seat also boasts adjustable height and angle to cater to fit varying preferences. Not only is it removable—the seat is also small enough so users can mount 2 seats in one paddleboard. This way, it is easier to encourage and train kids to ride paddle boards. Beginners find an instant center of balance using the seat as their guide. They can start paddling while sitting and try standing up later. The seat serves as 'training wheels' for aspiring paddleboarders. Parents who want to encourage their kids to take on paddleboarding will have an easier time taking them out to the open sea by mounting 2 seats in one paddleboard. Pros can take on longer paddling distances as they can rest and relax on the seat after long periods of standing up on their boards. This way, they can save up energy for the return paddle. Most importantly, the SupSeat opens up paddleboarding to those with physical limitations, allowing handicapped people to enjoy the thrills of the sport.